As we wrote recently for Education Technology Solutions magazine, when schools fully understand the range of options, and the important differences between them, teachers and ITC co-ordinators can choose products that are compatible, have a wide range of applications, and will simply be school-proof enough to survive too much kid-love. When funds are tight, there can be nothing worse than an expensive white elephant taking up space in the IT room. To help your school gain the benefit of the clever folk inventing and innovating on your behalf, here are some considerations to maximise technology in your school, while saving money now and in the long term. Click here to read the full article in Education Technology Solutions (note this was written when we were known as Powered Life). Click here to read more articles on education technology from Maximise Technology. 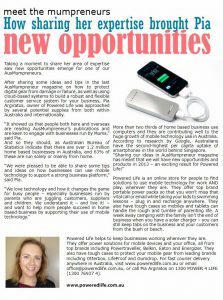 After sharing some ideas and tips in the previous AusMumpreneur magazine on how to protect digital gear from damage or failure, as well as using cloud-based systems to build a robust and flexible customer service system for business, Pia Argiratos from Maximise Technology (as our former name, Powered Life) was approached by several potential supplies from both within Australia and internationally. Read all about it here.